Capturing everything you love about your favorite vintage T-shirt, Coyuchi jersey bedding is just that soft, just that comforting and just that easy to care for. It's so sublime you'll want to sleep on it every night-and maybe sneak in a few afternoon naps, too. 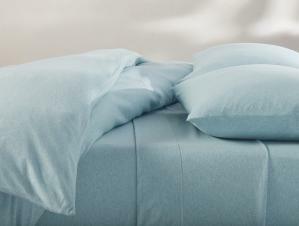 Flat sheet has a 4" self hem and pillowcases have an envelope closure. Fitted sheet has a deep 15" pocket and full elastic around the bottom. These Sheet Sets include a flat sheet, fitted sheet, and 2 envelope pillowcases (1 pillowcase for Twin sizes). All Coyuchi organic cotton is grown by family farmers organized in cooperatives. Coyuchi willingly pays premium prices to these small-scale growers for their organic cotton fiber because this encourages organic practices that protect not only the environment, but the farmers, their families, and their communities from exposure to toxic agricultural chemicals. Also, by purchasing their cotton at a better price, we help support local and economically sustainable production. You’ll find beauty and exceptional caress in these sheets. Made from certified, organically grown cotton, this bedding will impress you with its natural opulence and satisfy you with its eco-friendly ramifications. No toxic bleaches, dyes or other chemicals are used in the production. Comes 99% pre-shrunk; fitted sheets have extra-deep pockets. All of Coyuchi cotton and linen products are machine washable. For whites and light colors: We recommend machine washing on the gentle or delicate cycle with warm water and non-phosphate soap. For dark colors: We recommend machine washing on gentle or delicate cycle with cold water and non-phosphate soap. Line dry, or tumble dry low and remove promptly. Use a warm iron on cotton, or a hot iron on linen, as needed. We do not recommend using whiteners as bleaching agents may diminish the brilliance and depth of the colors; when needed, use only non-chlorine bleach. Please refer to the product tag for more specific instructions. Coyuchi cotton products are all 100% organic and made using low-impact dyes and a nontoxic production process. This makes them a favorite brand among chemically sensitive groups. The ivory colored items are the natural color of cotton, and never whitened or dyed. All of Coyuchi cotton is 100% organic and we use only natural fibers, all of which are produced using a nontoxic production process certified to either the OEKO-TEX standard or the Global Organic Textile Standard (GOTS). This means we use none of the toxic dyes, bleaches or finishes used to make conventional textiles.